“Fall Rainbows,” Alkyd on canvas. At 84 years of age, I’m sure I’m the oldest artist to appear on this blog, and I came to fly fishing rather late compared to many others. However, I have been painting since the age of six, after being born in Tokyo, Japan in 1934. Unlike . 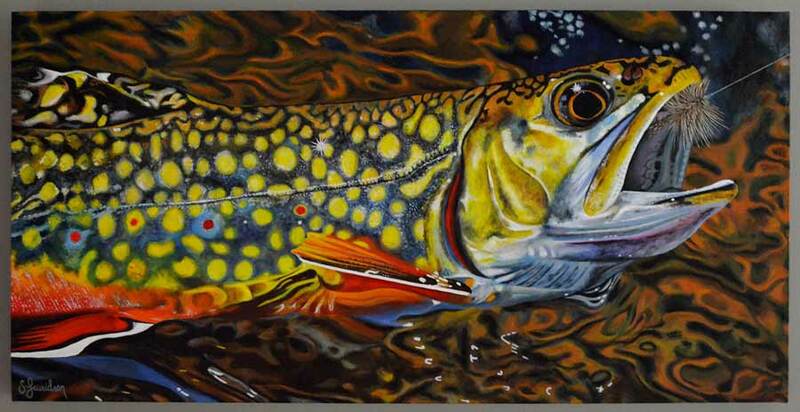 . .
Each painting is an exact rendering of a fish, such as this golden trout, landed during Chase and Aimee’s travels. As soon as I was old enough to hold a pencil, I was drawing things. Both my parents are creative and gifted in their own rights, and strongly encouraged their kids to explore their own creative . . .
A few years ago, we featured the artwork of Sarah Lauridsen, a Vermonter who is both an avid fly-fisher and artist. Today, out of the blue, she emailed me the brook-trout painting above, which blew me away. This time of year, the brookies are decked out . . .
We have featured the gorgeous art of Bob White many time on this blog (see here, here, here, and here, for example), and this short video profile gets to the heart of what makes him able to. 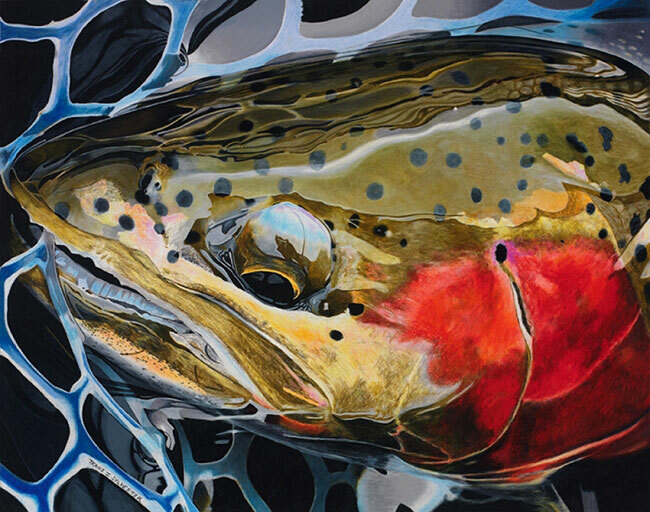 . .
Naturalist and artist Nick Mayer combines the observations of a scientist with the eye of an artist to create gorgeous fish paintings in his Lincoln, Vermont studio. 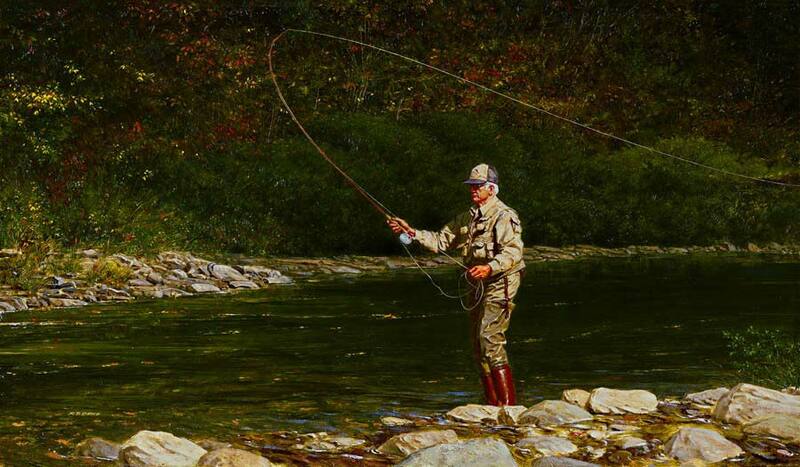 His love of fly fishing, fly tying, fish . . .
Sylvester does amazing work with color and texture. This fish really seems wet. Artist Travis Sylvester–whose work we’ve profiled before–sent me images of one of his new pencil drawings, which he calls “Net Working,” and it’s pretty astounding how he can capture the . . .
Editor’s note: Wildife artist Andrew Thompson believes that painting at its very best can express the very essence of the wilderness and provide a unique insight into the character and. . . Artist Galen Mercer lives along the Battenkill in West Arlington, Vermont. Canadian by birth, he’s the grandson of two painters and the son of another, so it’s kind of in his blood. (He’s also . . . 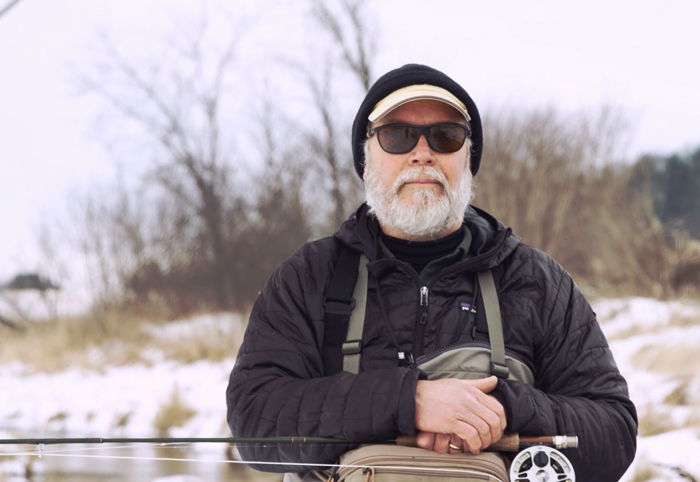 The star of the first episode of Season 2 of the “Find Your Water” series is Josh DeSmit, whom we profiled last summer. Follow him on some fishing adventures, as he discusses the. . .